I love a good tea party! Whether it is impromptu with my children with only cups of tea and toast, or planned a few days in advance with a friend or two, or a big, fancy affair with lots of people and a buffet full of tea foods. Christmas is a perfect time to bring out the teacups and sit down with someone special to drink in a few moments of the passing season. 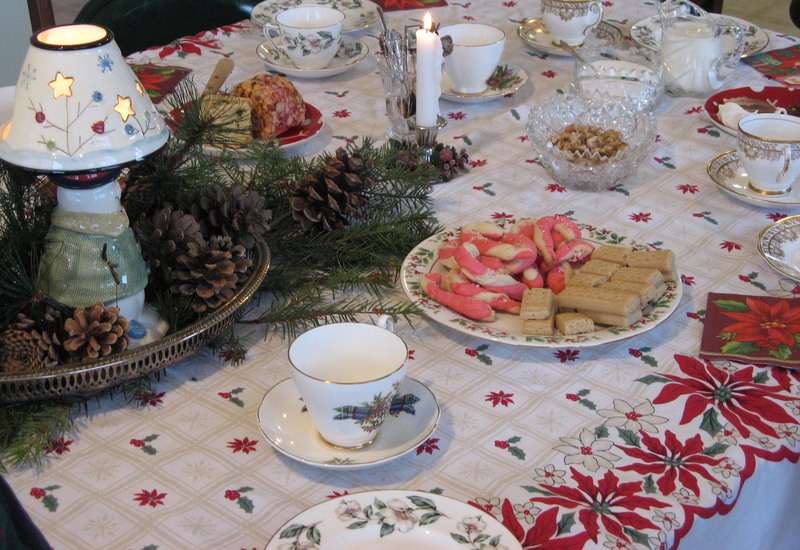 So many of the holiday foods are well-suited for a tea party: cookies, cheese ball and crackers, chocolate truffles, muffins, cranberry-orange tea loaf, squares of gingerbread, chicken salad sandwiches with dried cranberries, cut pineapple sprinkled with lime zest, homemade candies or chocolate dipped pretzels, etc. Holiday teas abound too. Think Gingerbread, Earl Grey, Orange Spice, Constant Comment (which now comes in decaf!!! ), Chai, Sugar Cookie, or Candy Cane Lane. Several recipes that I particularly like around the holidays are Gingerbread Muffins, Cranberry Bread, and Scottish Shortbread. 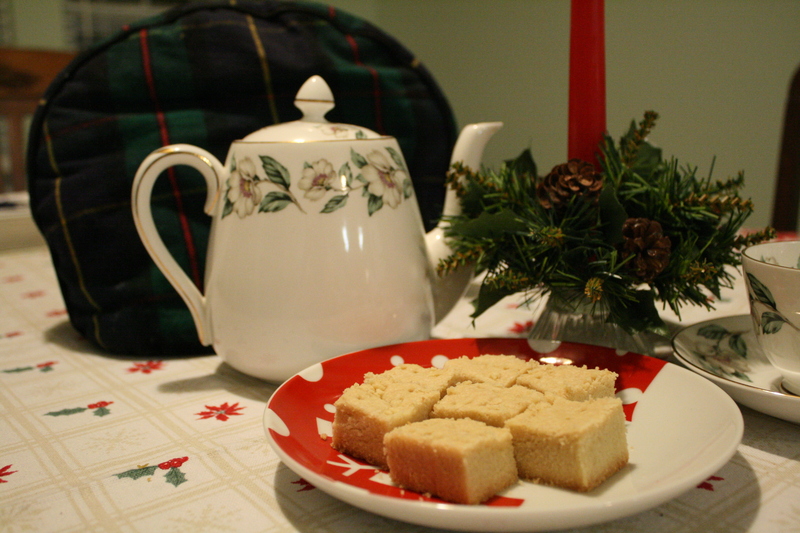 Every year I watched my mother make her ritual batch of shortbread, using the handwritten recipe card from her grandmother who had immigrated from Scotland. It is simple but rich and is a perfect accompaniment to tea. Gingerbread muffins are a wonderful invention. Doesn't everyone want to smell gingerbread scents wafting from their oven? 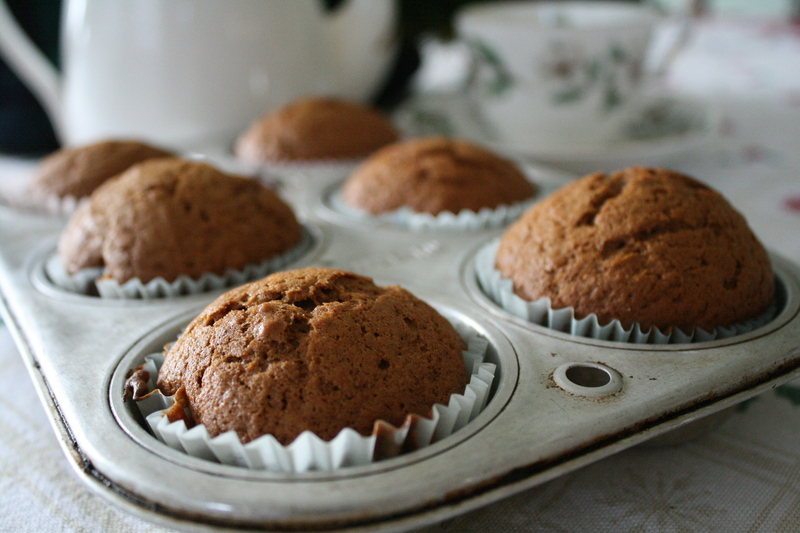 Muffins are easy to make and easy to serve with the same delightful aroma of real gingerbread. Preheat oven to 350F. Grease or line muffin tin. Combine flour, sugar, baking soda, salt, cinnamon, cloves, ginger and nutmeg. In another bowl, beat egg, oil, molasses and sugar, mixing well. Pour mixture into flour mixture. Mix until just moistened; add boiling water and mix until just blended. Fill muffin tins 2/3 full. Bake for 20-25 minutes or until muffins are done. Makes 12. Mix the flour and sugar together then incorporate the butter – this must be done with hands to soften the butter into the flour mixture. Mix with hands until soft and doughy. Depending on the softness of your butter, this may take 5-15 minutes. Spread dough in a 10x15” pan and prick evenly with a fork (allowing the fork to touch the bottom of the pan). 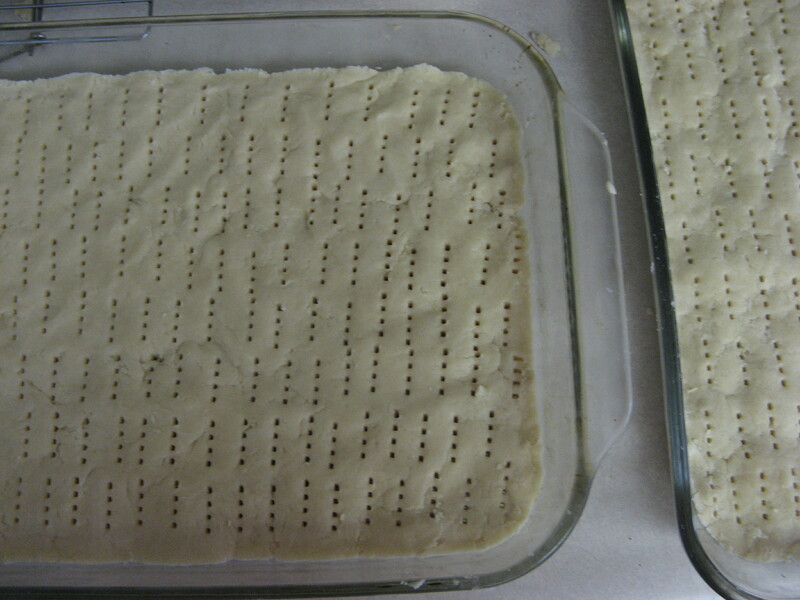 Bake 1 hour at 325F until edges just begin to golden – cut into 1-inch squares or 2-inch fingers while hot. Preheat oven to 350F. Grease a 9x5-inch loaf pan. Chop the cranberries and walnuts and set aside. 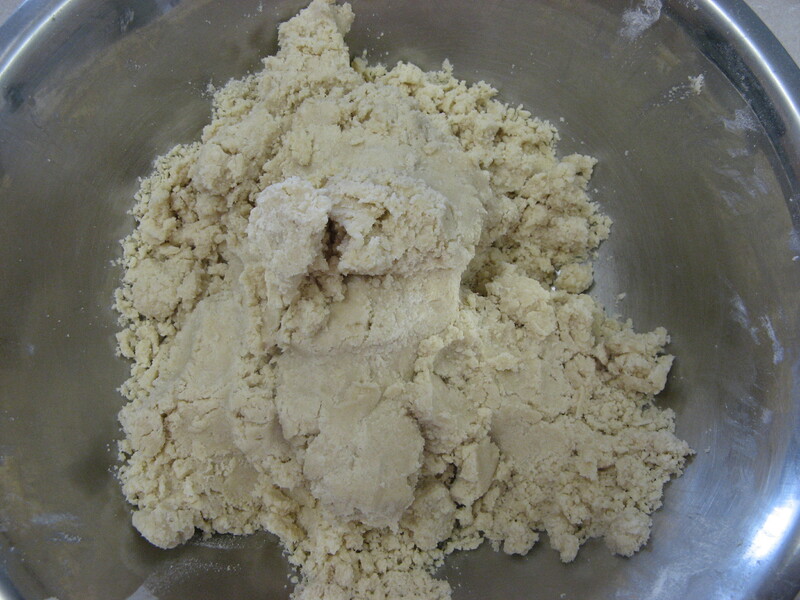 In a large bowl mix together the flour, sugar, baking powder, baking soda and salt. Stir in the orange juice, orange zest, egg, vanilla and butter. Fold in the chopped cranberries and walnuts. Spread the mixture evenly in the greased loaf pan and bake in the oven at 350F for 55 minutes. Allow to cool on a rack for at least 15 minutes. Will cut best if left to rest for several hours. Classic Heather, I love it! Thanks for sharing your secrets! Thanks, Heather!! 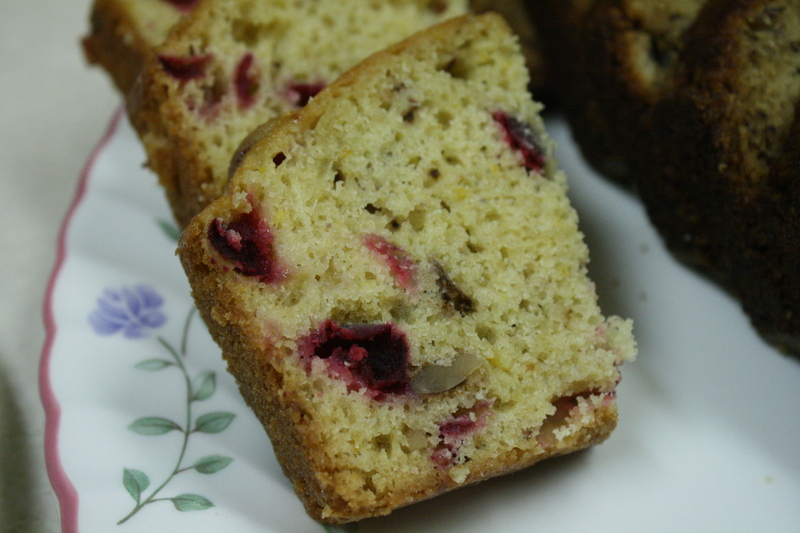 The cranberry bread is in the oven as I write--I was wondering how to use up half a bag of cranberries I had left over from Thanksgiving and this was perfect! Just wondering that maybe your shortbread is a little too thick? Is it more a doughy recipe rather than one for crisp, thin shortbread? Hi just wondering if you can take the orange juice out! Joanna -- I would substitute with buttermilk (milk with 2 tsp. of vinegar will do). However, the orange juice sure gives it a nice flavor!! !